With the Great Expansion, the existing six teams were placed together in the East Division while the newly added teams competed in the West Division. Each team played 50 games against divisional rivals as well as 24 against teams in the other division. The top four teams in each division would compete in the playoffs, with the quarter-finals and semi-finals determining each division’s champion. Those two teams would compete for the Stanley Cup. This alignment ensured that one of the six new teams would compete against one of the Original Six teams for the Stanley Cup. With a roster of fading stars, career journeymen and unproven prospects, the 1967-68 Pittsburgh Penguins assembled for training camp in Brantford, Ontario on September 13, 1967. General manager Jack Riley was pleased with the talent he had assembled. “Our fans don’t want a building program,” he stated. “They’re used to winners. We tried to select players with pride – good competitors who will go all out.” Ten days later, the team played its first exhibition contest in Brantford against the cross-state Philadelphia Flyers. The Penguins readied themselves for their season opener. One of the surprises of training camp was the emergence of Les Binkley, a 33-year-old rookie, who grabbed the opportunity to serve as the Penguins’ principal netminder, beating Hank Bassen who had led the Pittsburgh Hornets to the Calder Cup championship in 1967. Although Binkley had starred at the minor league level – including two AHL All-Star selections (1964 and 1966) and the “Hap” Holmes Memorial Award for the lowest goals-against average in the AHL in 1965-66 – he was finally getting his opportunity at the NHL level, and he was determined to stay there. The Penguins’ opening night roster averaged 32 years of age – oldest in the league. NHL hockey returned to Pittsburgh on October 11, 1967 as the Penguins hosted the Montreal Canadiens. With 9,307 spectators looking on, Senator Jack McGregor was joined by NHL president Clarence Campbell to perform the ceremonial faceoff between Ab McDonald, Pittsburgh’s newly appointed captain, and Jean Beliveau, captain of the Canadiens. That puck was bronzed and is used today as a paperweight on the desk of the senator. The Canadiens edged Pittsburgh 2-1 in that historic inaugural contest, with the Penguins’ first franchise goal scored by Andy Bathgate against Hall of Famer Rogie Vachon at 7:06 of the third period. The Penguins registered their first win two nights later; a 3-1 road triumph over the St. Louis Blues. They became the first expansion team to register a win over one of the ‘Original Six’ when they doubled Chicago 4-2 on October 21. One of the more curious aspects of the season occurred in a February 21, 1968 game against the Philadelphia Flyers. 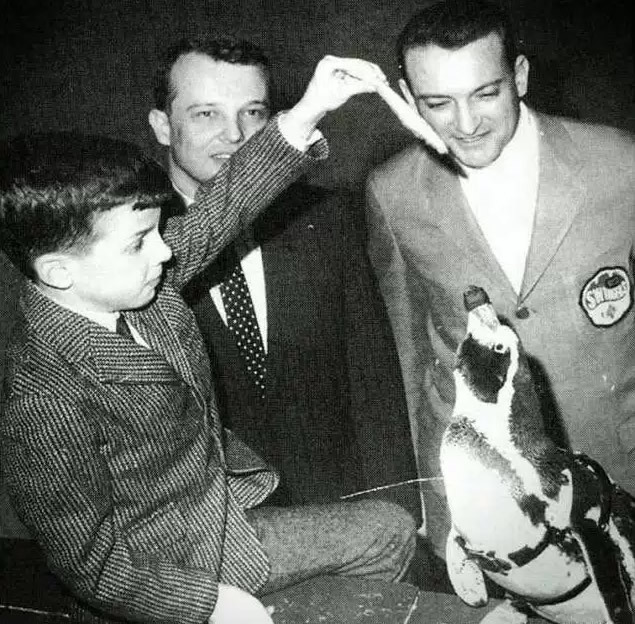 During the second intermission, Pete the Penguin, Pittsburgh’s mascot, made his debut, led on a leash by trainer Pete Shepis. Pete the Penguin was born in Ecuador and was loaned to the hockey team by the Pittsburgh AquaZoo, his daily home. Later, another penguin served as the team’s mascot through the 1971-72 season. His name: Re-Pete. Doug McGregor, 9, holds a sardine for Pittsburgh Penguins mascot Pete at a game on Feb. 21, 1968. Behind Doug is his father, Jack, one of the original owners of the club. At right is Pete's handler. Photo: Ottawa Citizen / courtesy of Jack McGregor. Any playoff hopes were seemingly dashed on March 2 when Les Binkley broke his finger in a 6-6 tie with Oakland. True to form, they continued to battle, and Binkley returned in time to lead Pittsburgh to wins in each of the final four games of the season, but it was too little, too late. The Penguins’ 27 wins equalled the number garnered by third-place St. Louis and fourth-place Minnesota, but their 67 points placed them fifth in the West Division, just two points shy of a playoff berth. To no one’s surprise, Andy Bathgate led the team in scoring with 59 points, including 20 goals. What was a surprise was his retirement at the end of the season. Ab McDonald was the goal-scoring leader with 22. 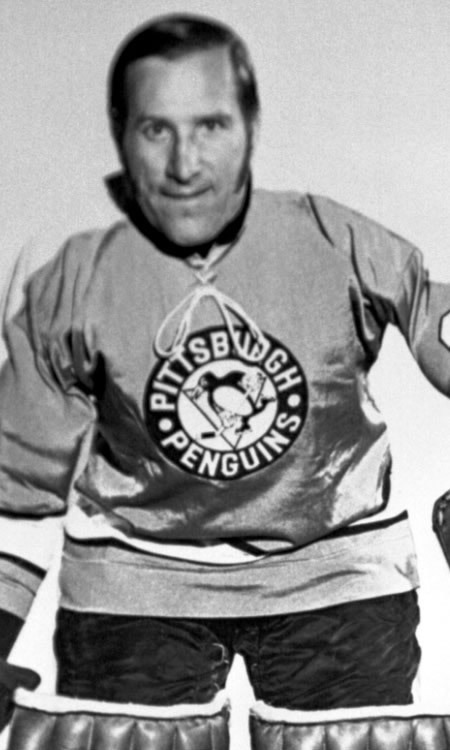 The Penguins also got reasonably strong offensive performances from Gene Ubriaco (18 goals), Billy Dea (16), Earl Ingarfield (15), Bill McCreary (14) and Ken Schinkel (14). Schinkel was the team’s sole representative at the annual All-Star Game. Arguably, the best performer that season (other than Pete the Penguin) was a surprise. Goaltender Les Binkley played 54 of the team’s games and despite a porous defense, concluded the season with an admirable 2.88 goals-against average and finished second in league shutouts with six.